Versatile and powerful, with a beautiful finish! 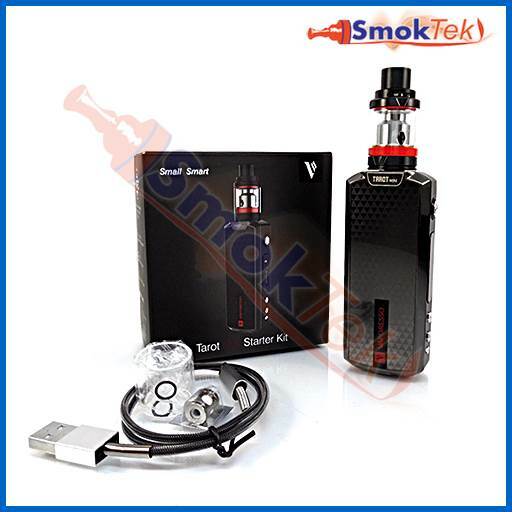 The Tarot Mini Kit from Vaporesso features the Tarot Mini mod and Veco atomizer. With up to 80W of power, Temperature Control and the precision of Vaporesso's OMNI board, the Tarot Mini mod is a versatile device sure to please! 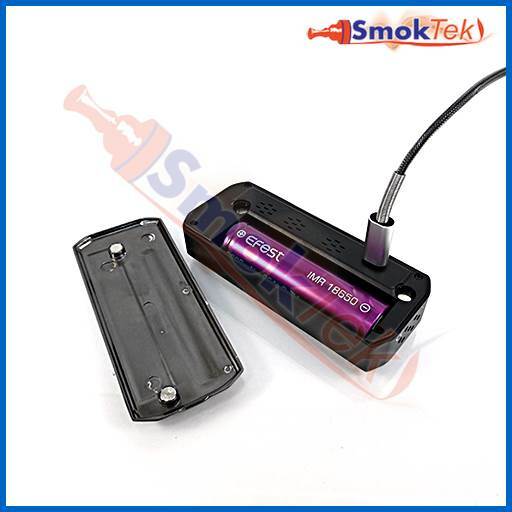 The mod is extremely well-built, featuring attractive Zinc and Aluminum Alloy and Carbon Fiber casting. 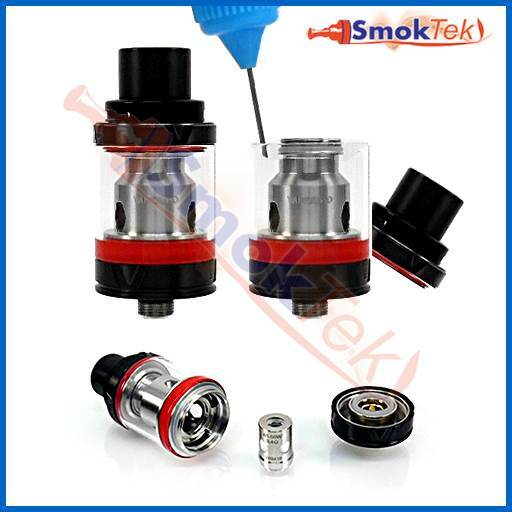 The Veco atomizer utilizes leak-proof design with top-fill capability and adjustable airflow. The Veco yields pure flavor from your e-liquids and excellent vapor production. It utilizes Vaporesso's revolutionary, eco-friendly EUC coil system. The Tarot Mini mod is a Variable Wattage and Temperature Control mod. 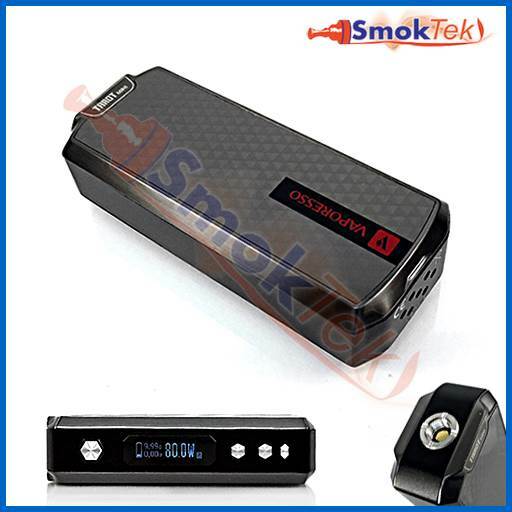 In Variable Wattage (VW) mode, you can adjust wattage between 5.0-80.0W in 0.1W increments. 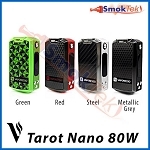 The Tarot Mini utilizes Smart mode with automatic atomizer recognition: the device will read the resistance and type of your atomizer as soon as a connection is detected. Using CCW and CCT mode, you can adjust ramp up time and consequent performance. In Temperature Control (TC) mode, you can adjust between 280-600 degrees Fahrenheit. In TC mode, the Tarot Mini supports Nickel (Ni200), Stainless Steel (SS316) and Titanium (Ti) wire coils. You can also dial in a custom TCR (Temperature Coefficient of Resistance) setting for other type of coil wires, such as NiFe, SS303 and others. The included manual features a handy TCR value range chart to help you find the ideal temperature setting for your wire material. If you enjoy using rebuildable atomizers on mechanical mods, the Tarot Mini can be set to Bypass mode to harness the full voltage output of the battery. The Vaporesso Tarot Mini utilizes the renowned OMNI board. This comprehensive board guarantees consistently reliable performance regardless of what mode of operation you are using, while offering multi-protection functions for maximum battery life. The Tarot Mini has user-friendly operation with a bright 0.91' OLED screen which displays your voltage, wattage, atomizer resistance, and remaining battery life at a glance. The ergonomic design makes this mod very comfortable to hold and use. A center-mounted, spring-loaded 510 connection ensures the Veco atomizer, or any other 22mm atomizer, sits flush and makes a proper connection every time. Because the Tarot Mini is firmware upgradeable, it means the device will remain relevant in your collection for a long time. The Tarot Mini does not have a built-in battery - instead it offers the convenience of user-replaceable battery (not included). You can quickly swap out your drained battery for a freshly charged one as needed. You can charge the battery separately with an appropriate Li-Ion battery charger, or take advantage of On-Board charging - with your drained battery still in the device, simply remove the battery panel. Plug in the included Micro USB charge cable into the revealed Micro USB port and into a computer. Please note: A battery and/or Li-Ion charger are not included with this kit. Use the "Make it a Kit" menu above to get both at a discounted price. The Veco tank is a top-filling tank with 2ml liquid capacity. Adjustable airflow located at the top, rather than the base, minimizes the chance of leakage. A wide bore delrin mouthpiece keeps vapor cool and facilitates "cloud" production. 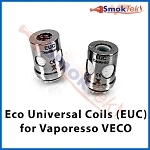 The Veco utilizes Vaporesso's revolutionary easy coil replacement system. Other atomizers have you replacing the entire coil head, but with Vaporesso's EUC coils, you only need to replace the core or "heart of the atomizer". This makes Vaporesso's EUC coils eco-friendly, as they cut down on waste. The Vaporesso Tarot Mini kit comes with two sub ohm (below 1 ohm) EUC coils. More coils are available here. It is s very easy to fill and to change the coil on the Veco. To fill the Veco, simply grip and twist the top cap to remove it. Then, fill the tank with your favorite e-liquid (be careful not to drip any inside the center tube - that is for airflow. Please do not over-fill the Veco). Screw the top cap back on. To change the coil, turn the Veco upside down, grip and twist the bottom/base to remove it. Simply grab onto the EUC coil and pull it out to remove. Insert a new/fresh coil unit, then screw the bottom/base back on. Please note: When using a fresh/new coil, please set the tank aside for a few minutes to allow the wicking material to absorb some of the e-liquid - this will help prevent it from burning when you fire the Tarot Mini mod. To speed up this process, you may drip a few drops of e-liquid onto the exposed sides of the EUC coil before inserting into the Veco. The Tarot Mini kit comes with all standard protections. If you are looking for an attractive, versatile setup with room to grow and the ability to swap out the battery as needed, the Tarot Mini kit is for you! Choose the Make It a Kit option to get batteries, a Li-Ion charger and/or a wall adapter at a discounted price! PLEASE NOTE: We highly recommend you take the time to carefully examine the included User Manual for a detailed breakdown of all device features and proper usage. Our standard 30 day warranty covers defective product.